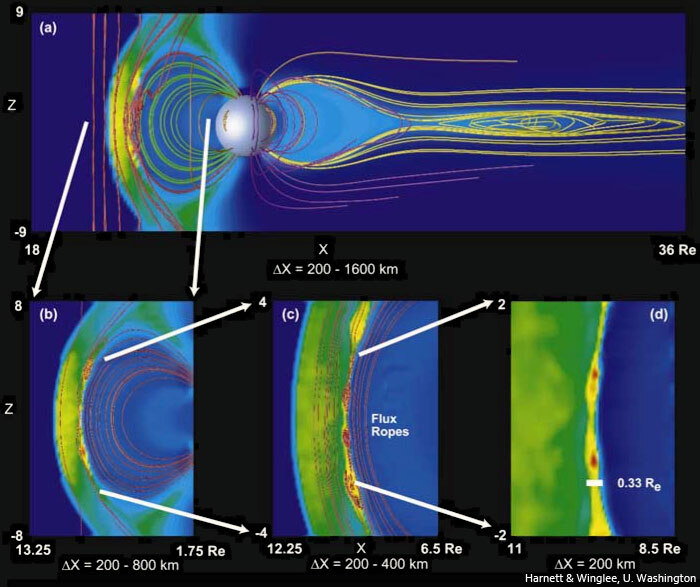 The solar wind serves as the ultimate driver of dynamics in Earth's magnetosphere, but the exact mechanisms responsible for the interactions are many and complex. 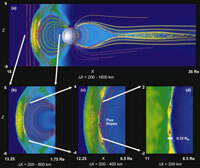 Examples include: chaotic solar wind plasma and IMF conditions, reconnection, flux transfer events, dynamics in the magnetosheath, and the highly variable nature of Earth's ion foreshock. These disturbances all impact the magnetopause, where they can then generate plasma waves, drive convection, and alter the background magnetic field throughout the rest of the magnetosphere. -	Topics: Magnetopause surface waves (THEMIS+, FTEs); Upstream phenomena (Foreshock bubbles, Hot flow anomalies, upstream waves, upstream jets); Coupling (to ULF pulsations and ground signatures). 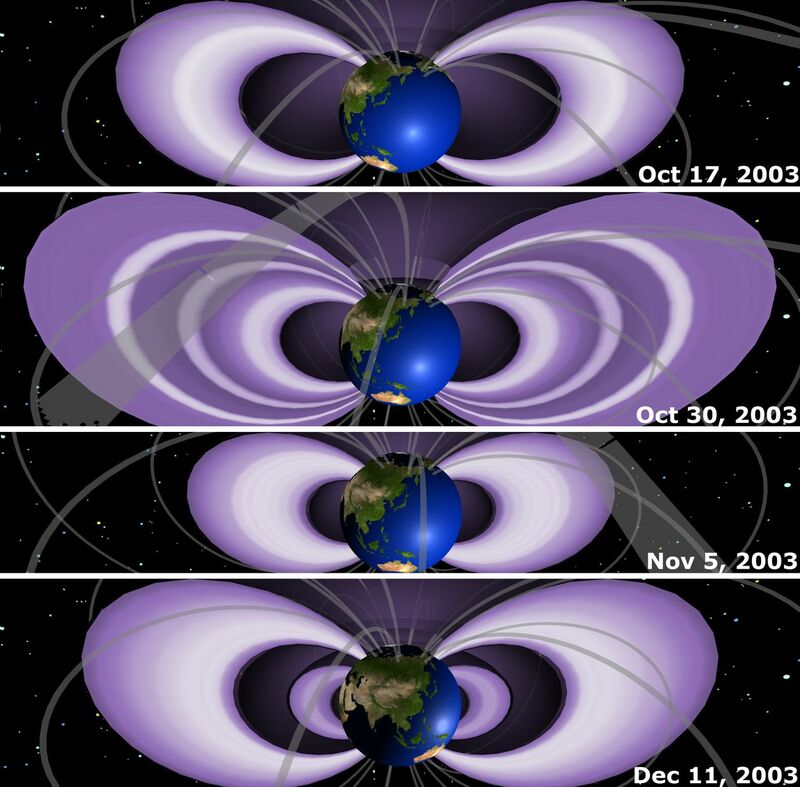 Earth's radiation belts consist of populations of relativistic protons and electrons that are stably trapped in torus-shaped regions of the inner magnetosphere. Various source, loss, and transport processes are responsible for the often drastic variations in the intensity of the radiation belts. The inner electron and proton belts, located within around 2.5 Earth radii near the equator, change on slower time scales over a solar cycle, though they can also be enhanced in relation to sudden solar events such as coronal mass ejections and solar energetic particle events. Earth's outer electron radiation belt is much more dynamic, exhibiting orders of magnitude changes in intensity over timescales ranging from minutes to decades. Some of the most important physical mechanisms in the belts include diffusive processes, which randomly scatter particles with respect to the background magnetic field, Fermi and betatron acceleration (and deceleration), and wave-particle interactions. 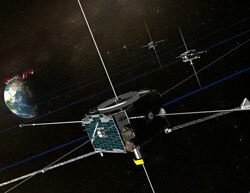 -	Topics: Energetic particle telescopes and missions (ELFIN, Lomonosov, THEMIS); comparing observations and theory to better understand various source, loss, and transport mechanisms (shadowing, scattering, heating); particle injections (THEMIS); wave-particle interactions with whistler-mode chorus, magnetosonic waves, plasmaspheric hiss, EMIC waves, and ULF waves; shock injections; diffusive processes; magnetopause shadowing; multi-spacecraft data intercalibration and analysis. The magnetotail in the night-side of Earth's magnetosphere is formed from the stretching of the planet's magnetic field by the solar wind. It consists of two lobes with the magnetic field directed mainly sunward (the northern lobe) and anti-sunward (the southern lobe), with the plasma sheet separating the two lobes. Whereas the lobes are populated by cold particles with low concentration, the plasma sheet is populated by hot plasma, mainly of solar origin. Variations in the solar wind and interplanetary magnetic field often trigger burst-like re-configuration in the plasma sheet magnetic field, which results in rapid plasma energization and acceleration. A portion of the charged particle population, energized in the dynamic plasma sheet, can propagate along magnetic field lines and bombard the planet's ionosphere and upper atmosphere to produce a spectacular phenomenon known as the aurora. 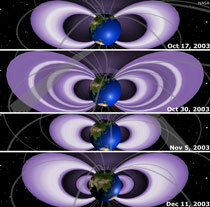 Other energized particles intrude into the dipole-dominant inner magnetosphere and become trapped in the dipole magnetic field, forming the ring current and radiation belts in the Earth's magnetosphere. -	Topics: Storms and substorms (energy and flux budget, onset timing, current systems); Plasma sheet dynamics (Low frequency waves, thin current sheets, reconnection, current sheet structure, plasmoid growth and release); Particle acceleration (injections, bursty bulk flows, current generation); Wave particle interactions (ECH). 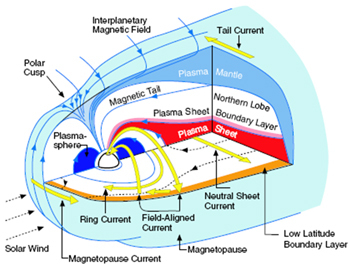 Magnetosphere-Ionosphere Coupling refers to the processes which interconnect the lower-altitude ionospheric plasma with the energized plasmas and mechanisms of the high-altitude magnetosphere. These processes include field aligned currents, waves, electric fields, particle precipitation, and ionospheric plasma outflow. -	Topics: Pulsations, field aligned currents (modeling, convection, closure), vertical currents that do not account for the ionospheric conductivity (similar to field aligned currents), equivalent ionospheric currents (horizontal to the earth surface), and particle precipitation. 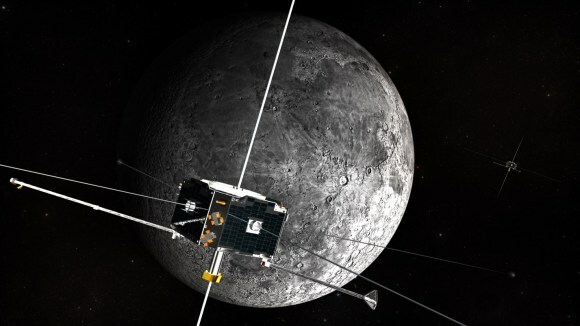 The "Acceleration, Reconnection, Turbulence and Electrodynamics of Moon's Interaction with the Sun" mission repurposed two of the THEMIS probes, sending them to the moon to study particle acceleration in the magnetotail, the solar wind, and the lunar wake. 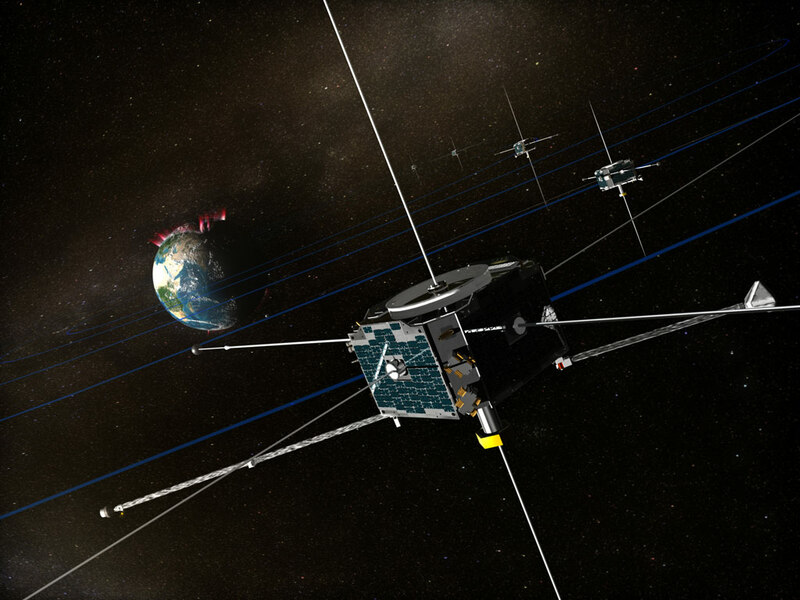 From their unique vantage point around the moon as it moves in and out of Earth's magnetotail, the two probes measure varying solar wind conditions in three dimensions, including electric/magnetic fields and charged particles. ARTEMIS characterization of the lunar environment contributes greatly to our knowledge of both heliophysics and planetary physics, and is also critical for future exploration of the moon and other airless bodies, especially for manned missions. -	Topics: Lunar interior modeling, Plasmoid generation and dynamics. 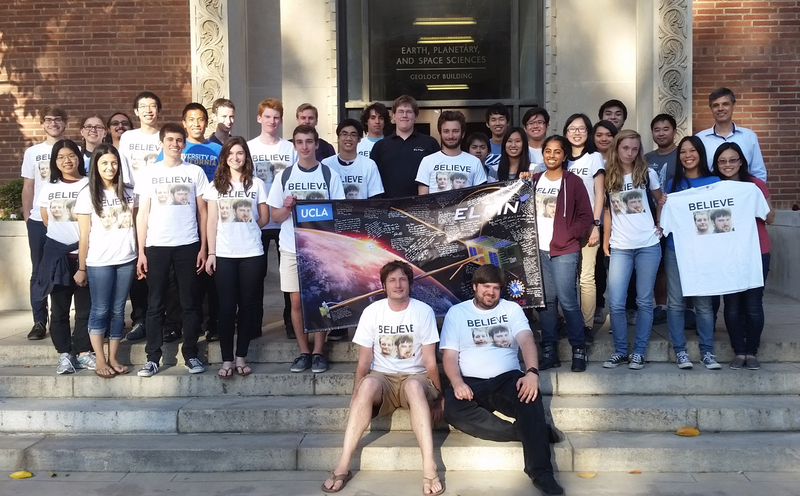 ELFIN Team June 2015... Believe! Want to join the ESP team? 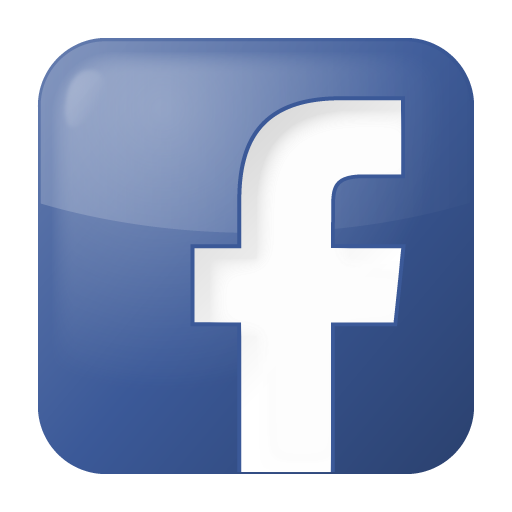 Click Prospective Students to learn more.